The season eight premiere of the final season of Game of Thrones is packed with plenty of awesome imagery - including some great peeks at Daenerys Targaryen's dragons (with Jon Snow on the back of one!). Her fire-breathing babies will surely play a big part in fighting the White Walkers and her quest for the throne, but let's not forget that she's down a dragon. In season seven, the Night King sadly kills Viserion and turns him into a wight to assist his undead army. Can Daenerys successfully defeat them with only two dragons? And more importantly for all the dragon-loving fans, can she ever get more of them? However, the season eight premiere also includes a new title sequence. that hints at the possibility of Dany finding at least one more dragon. 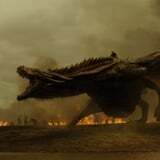 After the episode aired, Reddit user ninajo94 noted how when a sword blazes across the screen, you can catch a glimpse of four dragons - count 'em, four - decorating the metal, as well as a comet soaring across the sky. Now, if you've read up on the Azor Ahai prophecy, this should ring some bells. In A Song of Ice and Fire, the series of books that inspired the TV version of Game of Thrones, there is a popular myth surrounding a hero figure named Azor Ahai who allegedly rose up to save the world from the White Walkers centuries earlier by forging a legendary sword - Lightbringer - that helped him push the Others far, far into the North, where they were all but forgotten about.